With 24 GOP U.S. Senate seats up for grabs in 2016, vs. only 10 Democratic seats, the Republicans will be scrapping for every one, hoping to retain their majority. If Senator Menendez is forced to leave prematurely, they will be no less dedicated to that 25th seat, whether it is in a special election or during the normal 2016 cycle. There’s another important factor in play here: whom Governor Christie appoints as an interim Senator until an election is held. He could appoint a placeholder, as he did when he rewarded loyalist Jeff Chiesa after the death of Senator Lautenberg, or he could appoint a person who would stand for election for the remainder of Menendez’s term. What are the characteristics of the man or woman the GOP would like to see fill that seat? 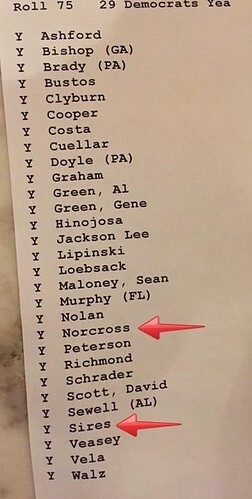 Here’s the list of Democrats who voted with the Republicans today to approve the $5.4 Billion Keystone XL pipeline. Two of the 29 are from New Jersey; Donald Norcross (NJ-1) and Albio Sires (NJ-8). House vote was 270-152, on a bill identical to one passed by the Senate in late January. Neither has posted on this vote; both know it wouldn’t be their best play (Norcross’ Twitter account is inactive since Jan. 21). Oddly enough, the tweets at the top of both congressmen’s accounts are about jobs; Sires here (from today) and Norcross here (pinned form Oct. 22, 2014). President Obama will have 10 days to issue a veto, which he’s very likely to do. Speaker John Boehner says the president is “standing with a bunch of left-fringe extremists and anarchists. (Watch). Norcross and Sires are standing with Boehner and the Republicans. It looks like there is a push to end the 50 year embargo against the island nation of Cuba and to normalize diplomatic relations, and that President Barack Obama and Cuba’s Raul Castro are on board. Senator Bob Menendez (D-NJ) is of Cuban ancestry and has long opposed such a move, and he vehemently opposes the decision to start talks with Cuba. Senator Marco Rubio (R-FL), an ally of Menendez on this in the past. is also unsupportive. It’ll be interesting to see what Senator Cory Booker has to say on the issue, and if it’ll cause a rift in the delegation.